Working together as an accomplished team for over a decade, Alix Wexler and Paul Romley combine their talents in real estate services, business management, communication and negotiation to offer a unique, proven sales and marketing approach designed to get you the results you deserve. Prior to her career in real estate, Alix ran 3 world-renowned clothing stores in Soho totaling 30,000 sq. ft. of retail space.... more. Paul successfully operated a contemporary/avante-garde art gallery in Soho. Whether you plan to buy or sell real estate, Alix and Paul can assist your every need in any price range from golf course communities, investment properties and single-family homes to waterfront estates, luxury condominiums, quaint mainland cottages and more. Their enthusiastic style and complementing personalities create a comfortable, professional atmosphere as they guide you through the intricacies of a successful real estate transaction. 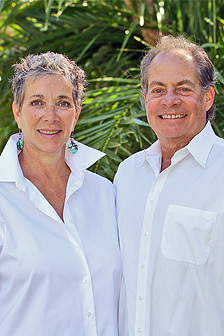 As international travelers and former residents of Paris, France; New York City; and New Jersey, Alix and Paul understand the needs and concerns of those choosing to relocate to Florida’s Gulf Coast. Their strong area experience and local market knowledge offer you no limits to the height of your success. Discover the advantage of working with two. Contact Alix Wexler and Paul Romley to ensure personalized, professional service for every step of your real estate experience. Alix and Paul are proud to contribute to the MSC Foundation with each of their real estate transactions. ...less.